25 grams of soy protein a day, as part of a diet low in saturated fat and cholesterol, may reduce the risk of heart disease. Two servings of Soy Complete supplies 28 grams of soy protein. Easy, Delicious & Satisfying. A meal So Complete, we called it Soy Complete! 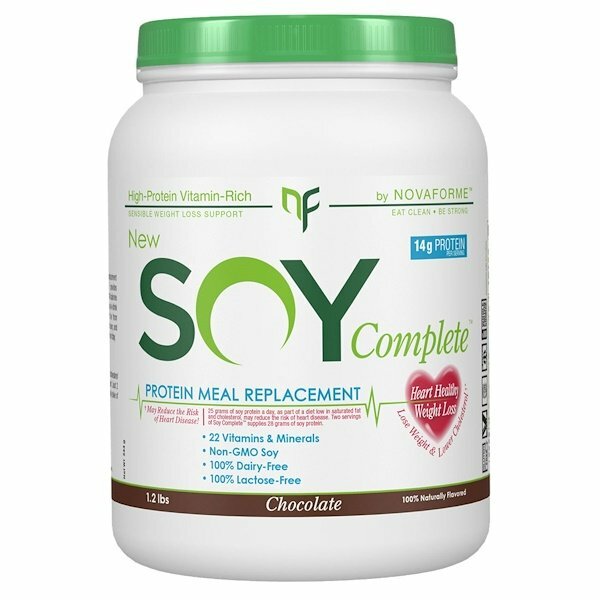 Soy Complete from NovaForme is an easy, delicious and hassle free meal replacement rich in 22 vitamins and minerals, including Vitamins A, C and D - Soy Complete provides you the support you need to help with a balanced diet and healthy lifestyle. Only 140 calories per serving and 14 grams of Protein, Soy Complete is all you need in one easy-to-drink meal replacement shake! 100% Dairy-Free, Lactose-Free, Gluten-Free and free from Artificial Flavors and Dyes, Soy Complete tastes amazing enough to drink on its own, and you can combine it with other fruits and vegetables for a delicious smoothie any time of day. The Food and Drug Administration has declared that "diets low in saturated fat and cholesterol that include 25 grams of soy protein a day may reduce the risk of heart disease". Just 2 delicious servings of Soy Complete supplies more than the recommended daily intake of soy protein necessary to reduce the risk of coronary heart disease. So easy, so complete. Soy Complete! Mix, Blend or Shake 1 rounded scoop (36 g¹) of Soy Complete with 1 cup (8 oz, 240 ml) of cold water, almond milk or your beverage of choice. ¹Due to natural variations in product density, resulting from settling and/or humidity, the values are approximate. Shake product before use. 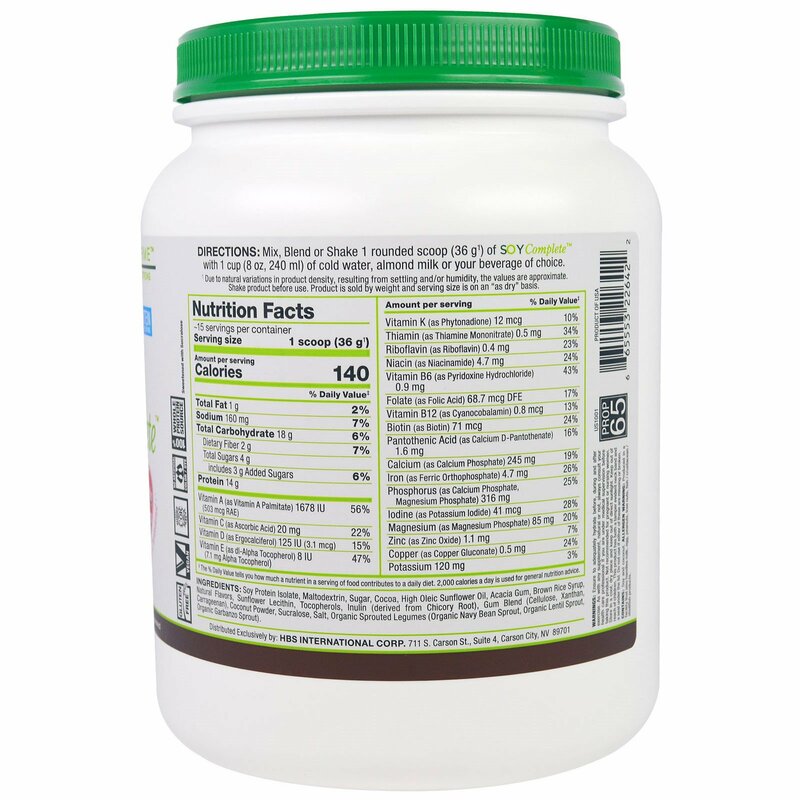 Soy protein isolate, maltodextrin, sugar, cocoa, high oleic sunflower oil, acacia gum, brown rice syrup, natural flavors, sunflower lecithin, tocopherols, inulin (derived from chicory root), gum blend (cellulose, xanthan, carrageenan), coconut powder, sucralose, salt, organic sprouted legumes (organic navy bean sprout, organic lentil sprout, organic garbanzo sprout). Allergen warning: Produced in a facility that also handles milk, egg, peanuts, tree nuts, fish / crustacean / shellfish products. Product is sold by weight and serving size is on an "as dry" basis. Ensure to adequately hydrate before, during, and after exercise. As with any supplement, natural or not, always consult your health care professional if you are under medical supervision before taking this product. Not recommended for pregnant or nursing women. Store in a cool, dry place and keep out of direct sunlight. Keep out of reach of children. This product has both a tamper evident neck band and a seal under the lid. Do not use if either of these are missing or broken. ‡ The % Daily Value tells you how much a nutrient in a serving of food contributes to a daily diet. 2,000 calories a day is used for general nutrition advice.